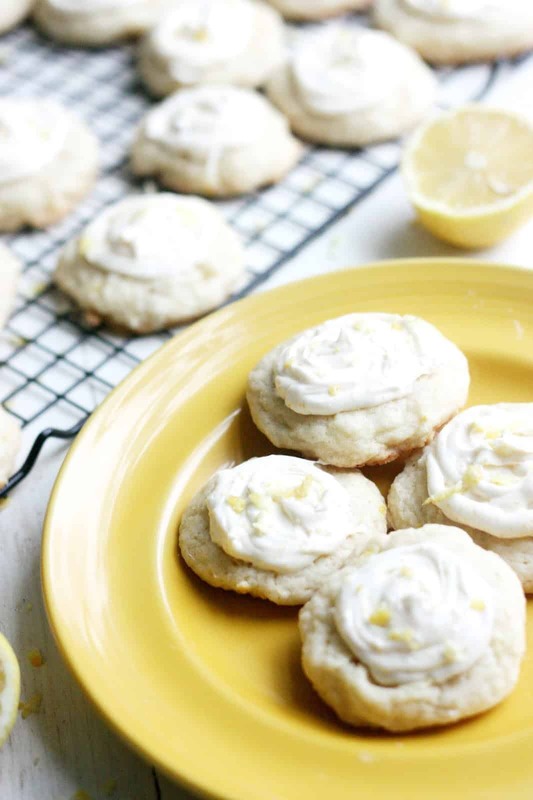 Make EASY, soft lemon cookies with the most delicious cream cheese frosting you’ve ever had! Shortcut with a cake mix or cookie mix. SO good! The first little shoots of tulips and crocus are making their way up in my yard so I am in complete spring mode. This springtime itch has me painting my nails the brightest pink, shedding my bulky winter sweaters and bringing the flavors of warmer months into my kitchen. This joy over spring’s appearance (finally!) 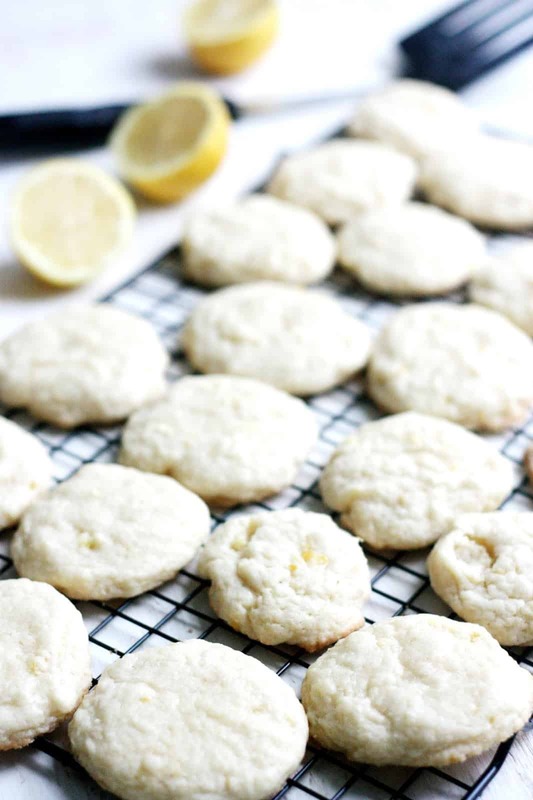 has also had me craving some lemon cookies, and I had to share them with you. 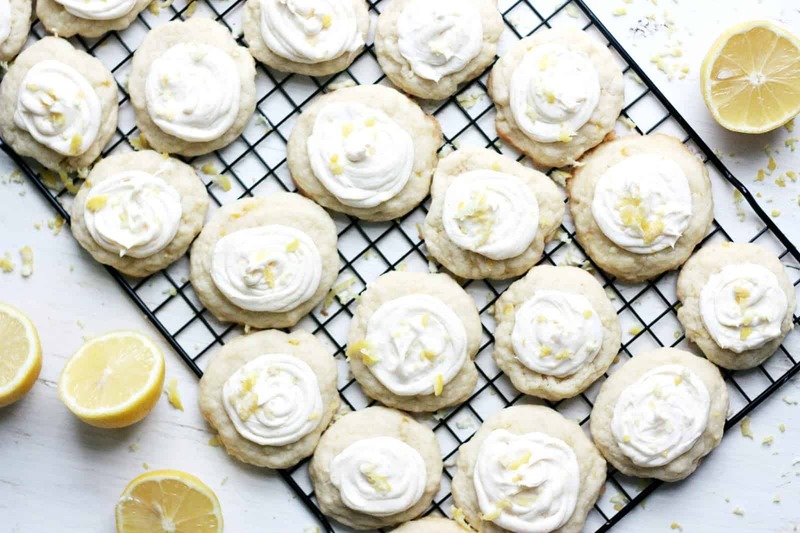 This lemon cookie recipe is moist, chewy and creamy, with the perfect tart flavor, making your insides feel as springy as the tulips popping up outside. You are going to LOVE this recipe. It is a springtime staple in our house and I know you’re gonna eat it up (Literally + figuratively.) YUM. 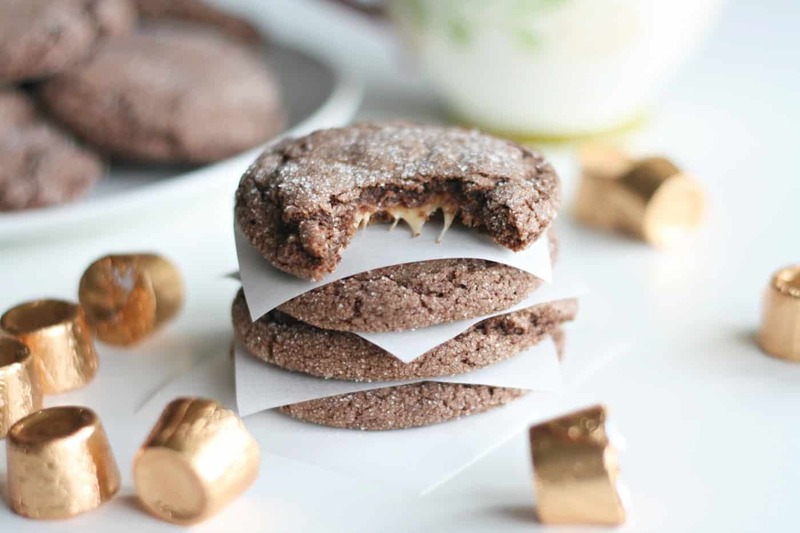 If you want the perfect cookies, you’ll need to make sure your baking is on point. Here are a few good tips. 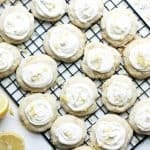 Since this lemon cookie recipe uses a dough that is lighter in color, you’re going to look for golden edges to make sure that they are done. You want to make sure they are a light brown or dark gold – but not too dark! 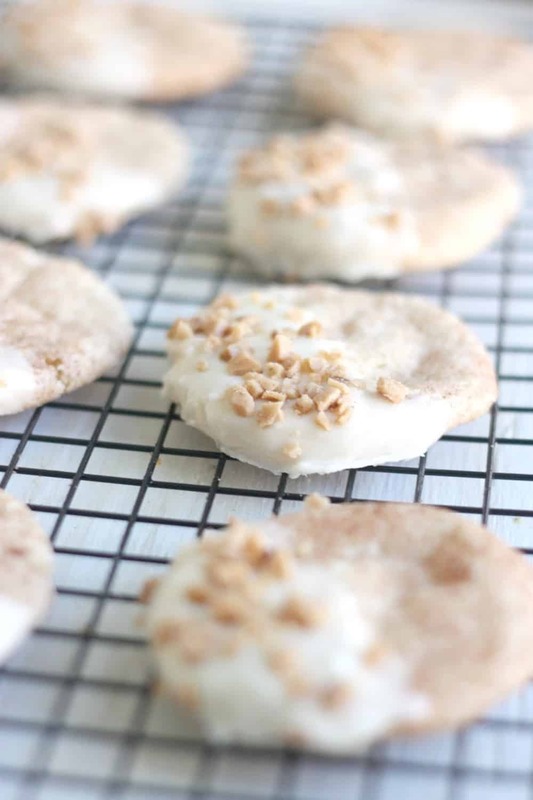 You can even slide a spatula underneath one cookie to see what the bottoms look like. 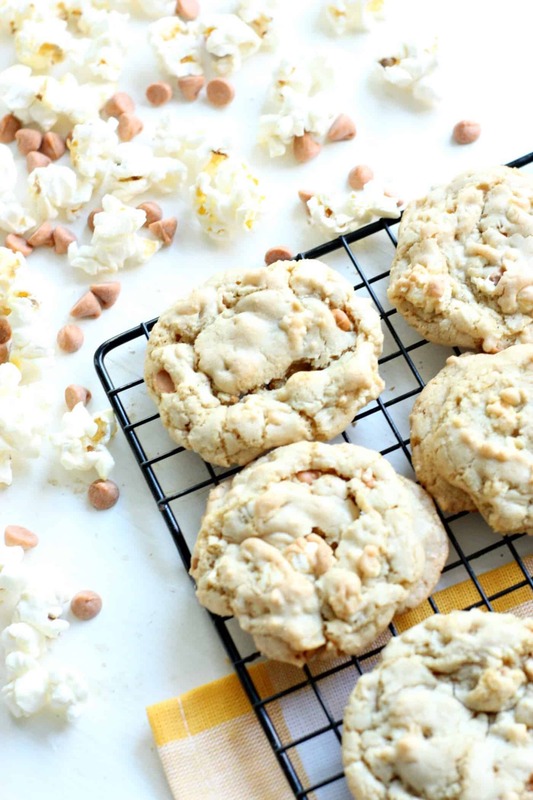 You obviously want to avoid burning or cookie bottoms that are too crisp. The second indicator that you need to remove these cookies from the oven is a slightly puffy center. The centers will look a little soft, but will continue cooking on the sheet or rack when you remove them from the oven. This is the same whether you use a cookie mix or cake mix. 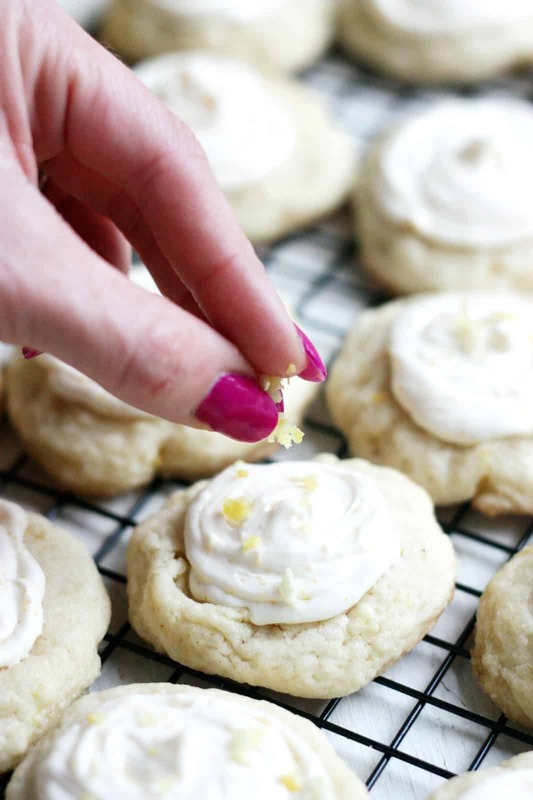 Are you ready for the best lemon cookie recipe ever? Keep reading! Preheat oven to 350 degrees. 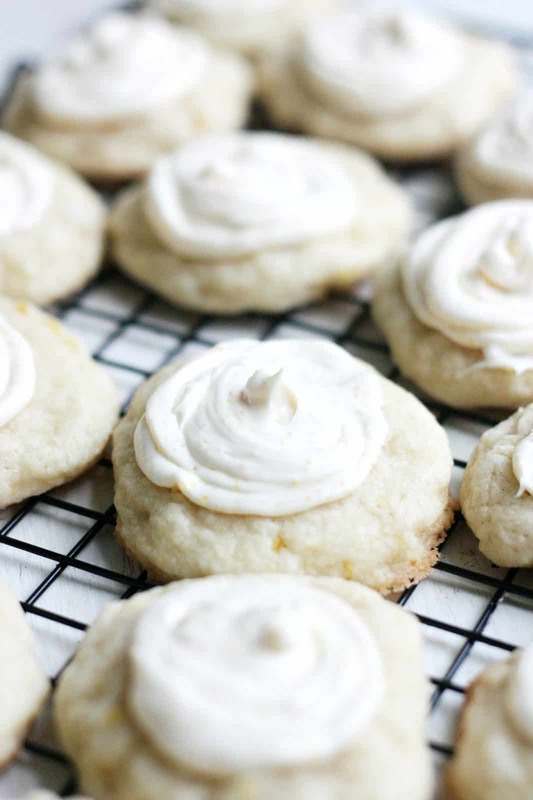 Place cookie mix, butter, egg, vanilla, and lemon extract in a medium bowl. Stir until dough forms. Roll into balls and place on greased cookie sheet. 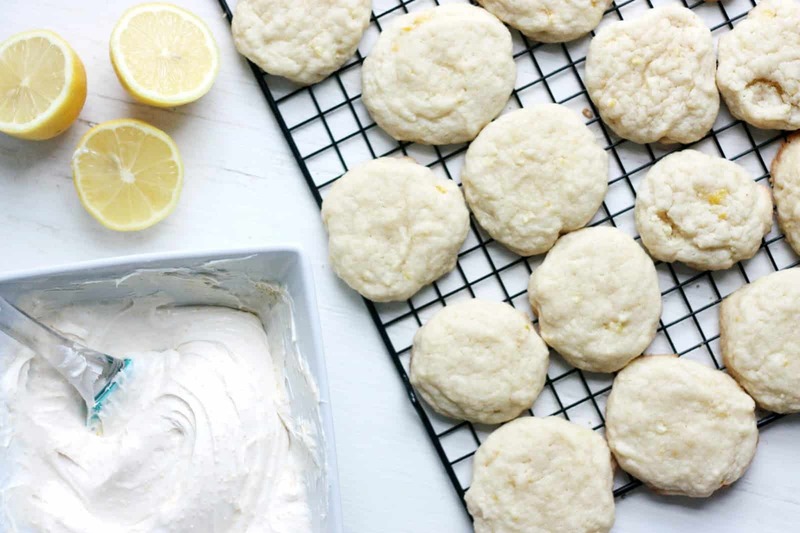 Bake for 8 – 9 minutes. Remove from oven and let cool completely. 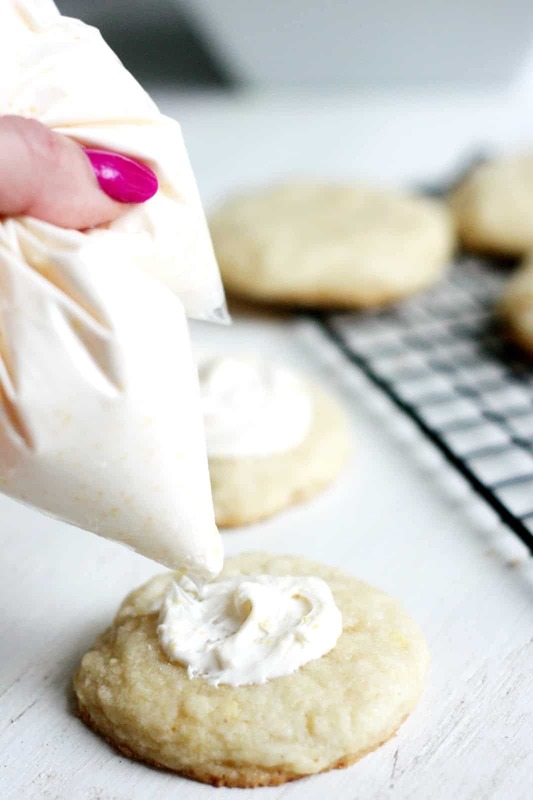 While cookies are cooling, whip the cream cheese until smooth, add powdered sugar, and combine with mixer. Add vanilla, lemon extract, any extra powdered sugar to taste, and sugar sprinkles. 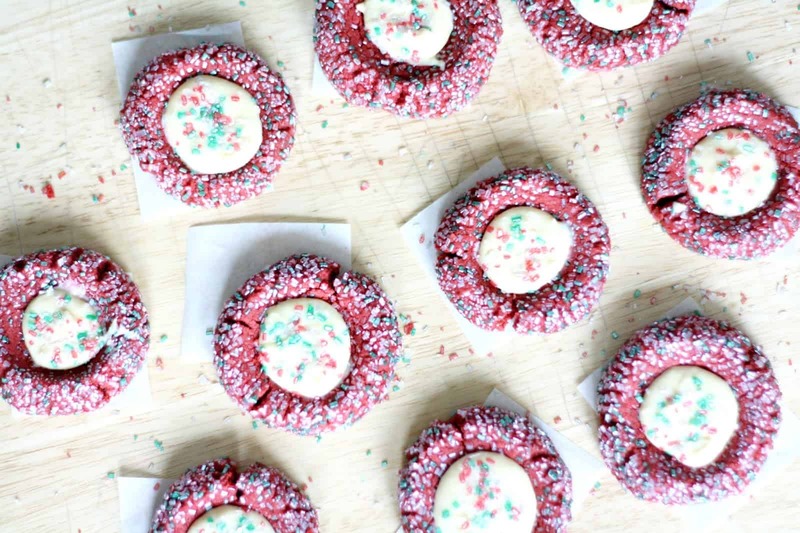 Fill ziploc or pastry bag with icing and pipe on cookies. Top with remaining lemon zest. 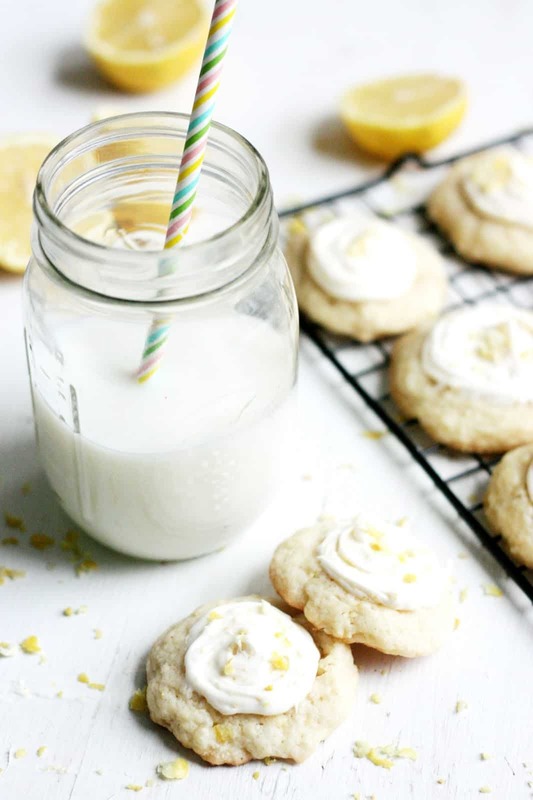 Make EASY, soft lemon cookies with the most delicious cream cheese frosting you've ever had! Shortcut with a cake mix or cookie mix. SO good! Bake for 8 - 9 minutes. Remove from oven and let cool completely. Aren’t they glorious? 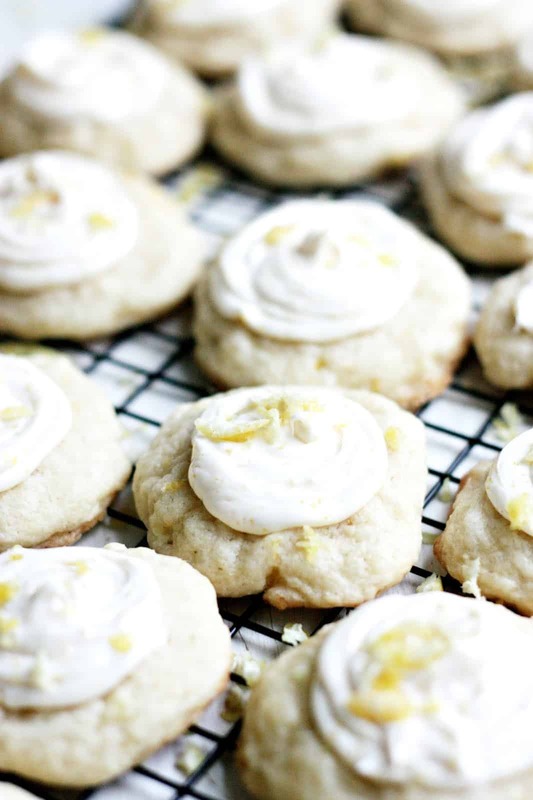 The lemon flavor is the perfect amount tartness and the frosting is so creamy I want to bathe in it. Or just eat a bunch of it with a spoon. Either one. What are the recipes you love making when spring finally comes around? Share away! And be sure to visit us as we blog about style, food, and the things we love over at the Pretty Life Girls.